Not really, but this morning we gathered outside and socialized while waiting for the Rabbi. RB: Last week there were questions about the dates for the priesthood: First Temple was destroyed in 586. Solomon died in 930 BCE so we know that there was animal sacrificing happening at that time. The origins of the priesthood probably date back to that time as well. Remember that much of this is retrojection and likely incorporated extant practices into past events. In Israel the Bible is taught as history – in order to assert a claim to the land. Biblical teaching there starts with Kings – rather than Genesis. Page 707 We have just had the ordination of priests, here we address different kinds of sacrifices. Animal sacrifice is highly problematic theologically and very contrary to modern notions of worship. 9:1 The purgation offering. See Essays on page 734 and 705. Also, the burnt offering. This is happening on the eighth day of the ordination of the priests. The eighth day indicates starting over at a new level – one more than whole. Also, a return to “normal.” The peoples purgation offering, the meal offering, the sacrifice of wellbeing. Note the “elevation offering.” What does “presence” mean here? It could mean the smoke. It is unclear as to what made the people “fall on their faces.” A belief that God was present? How does G manifest to the blind and the deaf? Fire can be sensed by four of the five senses. This is a description of “doing it right.” insofar as the rituals are concerned. Vassar Temple Sisterhood has many wonderful traditions, and this is certainly one of them. 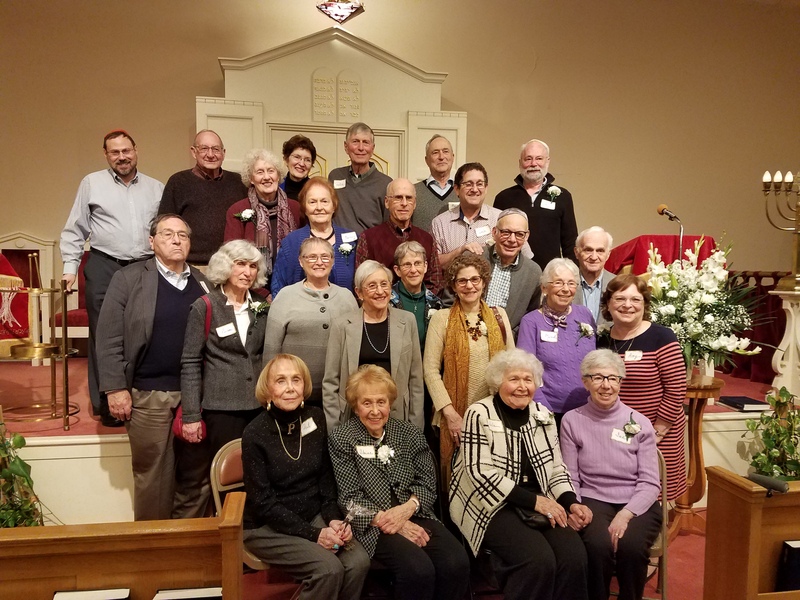 Some years ago Sisterhood took over a temple practice – to organize and conduct a Friday night service called a “Generational Shabbat.” During this lay-led service, which Sisterhood members conduct, the Temple honors people who have been members of Vassar Temple for 40 or more years. Part of the tradition includes having the Men’s Club host the Oneg. Special thanks to our organizers including but not limited to Sisterhood President Judy Rosenfeld, Past President Melissa Erlebacher, Bonnie Scheer, and the many others involved. Each year the bulk of the names & faces are the same. We are proud to have some join the ranks, and deeply saddened when we lose anyone. And of course, not everyone can make it to the service. Here is a picture of the “class” of 2017 (5777). To Vassar Temple, these people need no introduction. I love the way Lila Matlin and Sue Barbash are holding hands in the front row! Classy and strong Muriel Lampel is just behind them. Look at Gloria up top, with her big smile; her vigor and thirst for adventure is really special. See Linda Cantor on the left in front of Richard. I am in awe of Linda’s sensitivities. And of course, there is Elaine L in the front row who faces the camera and life head on with great spirit. Each and everyone is special in their own way! The lifelong bonds that can be made at a temple make one’s life richer – increasing the joy during happy moments, simchas, and comforting one during life’s inevitable trials and tribulations. We know there are many people in the community who were members of Vassar Temple years ago, but are now unaffiliated with any temple. Please know that it is nerver to late to come back and be with old friends, as we all make new ones.